Recommended to: Readers who enjoy tough characters and unique storylines! The Blue Blazes – the first in a new urban fantasy series in which lovable thug Mookie Pearl must contend with the criminal underworld, the supernatural underworld, a new drug that makes the invisible visible, and a rebellious teen daughter who opposes him at every turn. Wow, what a ride! 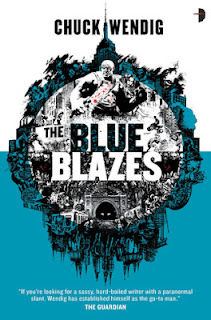 The Blue Blazes is one of those reads that you pick up, intending to read a few pages, and then just can't put it down. A perfectly wild plot meshes with plenty of tough and quirky characters into something that is just too delicious for words. However, since this is a review after all, I'll do my best to put it into words. Let the raving commence! The prose in this book was a little more choppy than what I was used to. I soon came to love it though, especially once I met Mookie Pearl. A tough guy of the highest caliber, Mookie is all about brute strength. Don't let his appearance fool you though. Mookie has a good head on his shoulders and a large heart to match it. I couldn't help but fall in love with the way he functions. As a father, as hired muscle, and just as a human being. Which is actually how I felt about all the characters in The Blue Blazes! I was pleasantly surprised by the cast of characters that accompanied Mookie in this book. Unique personalities that showcased both their strengths and their weakness made for a set of people I couldn't help but love, or hate as the case may be. This is the perfect example of why pitting the good guys against the bad ones doesn't always work. There are grey areas, and Chuck Wendig isn't afraid to explore those. Add in a world that sets organized crime against the gritty underworld, and you have a book that I just couldn't get enough of. I could ramble endlessly about how hard I fell from this book, but I'd rather let you discover it for yourself. Let's just say that The Blue Blazes is absolutely worth a read. This is my first Chuck Wendig book, but mark my words when I say it won't be my last.